Please vote for Scott Dreier, Best Male Cabaret Artist! Scott Dreier has been nominated for the 2014 Broadwayworld Best Male Cabaret Artist--for LA run of Doris and Me! Please take the time to vote for him! Let's do what we can to help him win! Please share with friends and family too! It's not too late to send your holiday greeting! We are putting together a book of all your holiday well wishes for Doris. If you would like to send a holiday message and include a photo of yourself or your "babies", please email it to us at webmaster@dorisdaymagic.com. Be sure to include your name and where you're from. The cutoff will be December 18, 2014 so that we can make sure Doris has it for the holidays. 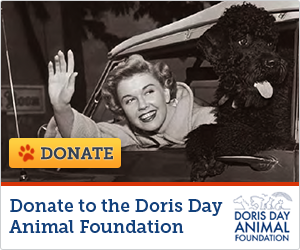 As always please consider a holiday gift for Doris in the form of a donation to the Doris Day Animal Foundation if you can!